Shooting with your strobe too close to the camera lens causes Backscatter. This lights up tiny particles in the water and results in our pictures looking like they were shot in a snowstorm! 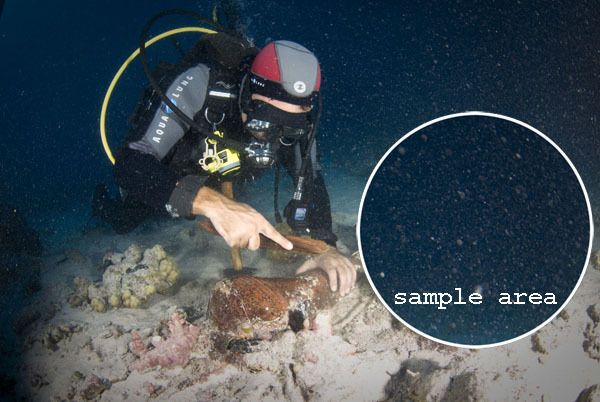 'Common' Backscatter: crud in the water that is usually uniform over the whole image. Usually variable in size and maintaining some color. Is only really noticeable against a dark background see below. Terminal - not worth editing, bin it! The above image shows common backscatter and is a 4 on the above scale. Notice how it is only evident against a darker background. The light foreground suffers from the same crud yet is not noticeable. Real backscatter is noticeable even against a light background.